A traditional recipe with a twist, crispy potatoes seasoned with Knorr Coating Mix Marinade adds depth to this dish, crumbled feta to finish it off. The base of Knorr Tomato Puree saves time as it’s ready to serve. Heat fryer with Rafhan Corn Oil to 180°C. Then fry the potatoes until golden brown, season with Knorr Coating Mix Marinade and keep aside. In a pan heat the olive oil & sauté onions, peppers and garlic. Season with cumin, paprika and black pepper before adding Knorr Tomato Puree simmer for 3 minute to allow flavours to develop. 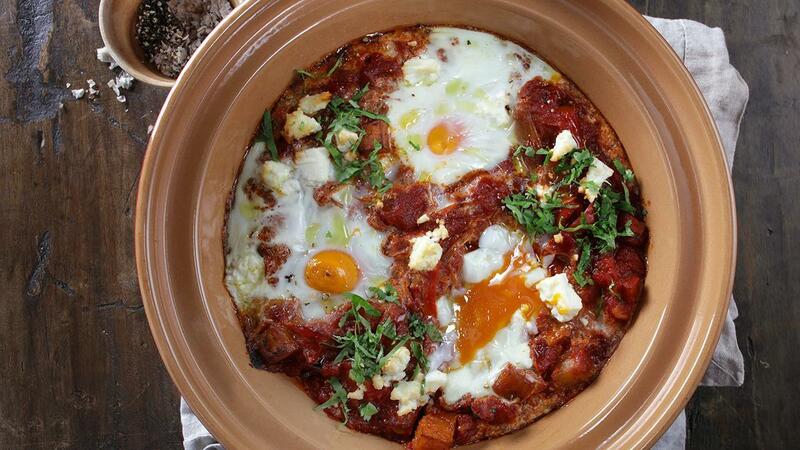 Next add in the fried potatoes, place into a tagine and crack open the eggs on top. Bake in the pre-heated oven for 12-15 minutes. Garnish with crumbled feta & fresh coriander.